A certain energy radiates from Missoula Valley: it is a meeting place. Three rivers meet here, filling Missoula with a steady and soothing sound of the water which is a constant rhythm running through the heart of town. Missoula sits at the confluence of five mountain ranges and is surrounded on all sides by outdoor adventure. It is here where culture meets exploration, where entertainment meets relaxation, and where dreams meet reality. It is also where expectations are always exceeded and something new is always waiting around each city block. Meet Me In Missoula weekend is a time to come together and a time to celebrate. Our town is a pretty special place, and we love sharing that with visitors from near and far. The vibrancy of our town is palpable in the spring months. Color paints the mountains. Green hillsides play home to wildflowers, wildlife, and wild adventures. 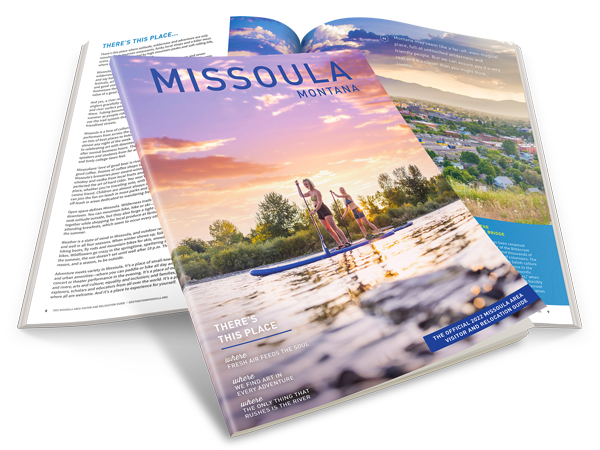 Meet in Missoula and experience all this town has to offer. Missoulians love really good food, so our town is full of charming, delicious restaurants to fit every budget. From food trucks at our Saturday markets and delicious hot bars at the Good Food Store and Orange Street Food Farm to fine dining at Plonk and Red Bird, you will be impressed by the taste and quality of the food cooked up here. Local staples like the Top Hat Lounge are fun fits for all ages, and ethnic foods like Masala Indian, Five on Black Brazilian and Tia’s Big Sky Tamales are great places to explore our bustling food scene. In addition, Missoula is famous for its many craft breweries and distilleries. Missoula’s downtown district offers world-class dining and shopping. Missoula is a regional shopping destination with two distinct shopping districts. Southgate Mall is the premier mall in western Montana offering chain stores like H&M, Maurice’s, Cost Plus World Market, Apricot Lane, JC Penny, Dillards, Dress Barn, Famous Footwear and many others. In addition, there is a brand-new movie theater, dining and activities. There is also great shopping in our downtown district. Find Griz wear, Montana souvenirs, and boutique shops on Higgins Avenue and other side streets. Every Saturday from May through October, there are two farmers markets in downtown Missoula and a Peoples Craft Market. Live music plays from theses markets and shoppers stroll and enjoy locally grown produce and locally crafted items. Missoula is a Gold-Level Bicycle Friendly Community. Nestled in the Northern Rockies of Montana, surrounded by seven wilderness areas and at the confluence of three rivers, Missoula is an outdoor enthusiast’s dream. You can kayak, raft or tube through downtown or take a relaxing hike in 60,000 acres of wilderness minutes from your hotel. Missoula is known for its blue-ribbon trout fishing (made famous by A River Runs Through It) and spectacular natural beauty. The outdoor recreational opportunities are limitless. Float the Clark Fork River in the summer and take a hike up the famous “M” trail to the top of Mount Sentinel. Bike the Riverfront Trail system or take a stroll in Greenough Park along the Rattlesnake Creek. Surfing, kayaking, paddleboarding and floating are popular activities on the Clark Fork River. Missoula has a vibrant arts and culture scene. Every first Friday of the month, galleries and shops host an art walk featuring snacks and adult beverages with live music and great displays of local artwork, pottery, jewelry and more. There are two art museums in Missoula and numerous galleries. The University of Montana has a great art program which brings in world-class art professors and students, and that art influence is see throughout town. There is also a wonderful theatre culture in Missoula. Missoula Community Theatre/Missoula Children’s Theatre produces musicals and shows throughout the year, and the University of Montana’s theatre program always has some wonderful shows, too. Ballet Without Borders is based in Missoula as well. Downtown events like Out to Lunch and Downtown ToNight are monthly occurrences in the summer, and the River City Roots Festival is a great way to celebrate Missoula in late August with live music, food trucks, and lots of fun. Our family friendly and fun farmers markets are a great way to spend a Saturday morning. Missoula has a surprisingly huge music scene. There are two outdoor amphitheaters, stadiums, and historic venues like the Wilma Theatre that bring in amazing acts throughout the year. Travelers’ Rest Music Festival happens in the summer, and headliners grace our stages throughout the year. Local bands play in brewpubs and smaller venues almost every night of the week, and people travel in to gather at our concert halls and venues. Check out our summer concert listings and be prepared to say “whoa” at the number of bands who are making their way through our town. Missoula’s options for live music are astounding for such a small community. Photo courtesy of Logjam Presents. Meet Me In Missoula weekend is one of our favorite times a year because it brings people together. Be that parents meeting with their children at the University, friends gathering from afar to spend quality time together, couples wanting to take a rejuvenating getaway, or families looking to have quality bonding with each other, this weekend celebrates those people and the connections that bring us all together. Missoula is a meeting place, after all—the rivers calm and the mountains sooth and the fresh air of remote Western Montana can refresh any person’s mind. Enter to win the Meet Me In Missoula Spring Weekend Giveaway. The prize package includes a 2-night stay at the Comfort Inn Missoula, 2 tickets to Missoula Community Theatre’s Newsies, 2 tickets to Garden City Brewfest, a Night Out at Southgate Mall including $70 in restaurant gift cards and a $50 AMC gift card in addition to another $50 in gift cards to Missoula restaurants. The last day to sign up for the giveaway is April 24th. Bring your friends and meet in Missoula for this favorite annual tradition and enjoy all the Garden City has to offer in beautiful springtime!